Forum » SpaceEngine » Science and Astronomy Discussions » Do red giants really look like they do in SpaceEngine? Do red giants really look like they do in SpaceEngine? It does look strange, but there really is an astrophysical reason for it. Giant stars have low surface gravities, so their outer convective envelopes are only loosely held. This makes them have enormous convective cells, like giant versions of the granules on our sun. There was an earlier thread on this topic here, but the difference in thread title may explain why the search didn't find it. Edit: Whoops, ninja'd by the Harbinger! I'm having this weird problem that make stars look distorted an bubbly looking. I have uninstalled and re-installed and to no avail nothing works. What type of star are you looking at? If it is a red giant or any star of the giant class they will be lumpy and bubbly due to their low gravities. If this is the case then it is not a bug. Maybe the red giants could have some type of slow bubbling motion so they could look more animated or active. Is it just me or are all red giants & red hypergiants ugly misshapen blobs? They are also pretty dim, dim enough that you can easily see the large variations of color and height in their surface, even from a distance. Is it because they are unstable dying stars that are in the process of ejecting their mass and / or collapsing? Is it because they are unstable dying stars that are in the process of ejecting their mass and / or collapsing? That's precisely why they look like that. Red giants have an extremely low surface gravity due to their massive size, and as a result the large, hot convection cells in their envelope are thought to cause deformations to the star. Their dimness is simply an effect of their temperature; something 3000 degrees hot simply isn't going to be eyeblindingly white like our Sun. So is the same true of all giants regardless of color class? I've noticed that even Blue & White giants have the same deformations, though not as extreme as a red, and tend to still be mostly spherical. The extent of "bubbliness" of the surface is primarily a function of the star's surface gravity, so the more bloated and tenuous the star's outer layers are, the more weakly it holds on to them, and the larger the convection cells become. This tends to be most significant with the red giants and hyper-giants that have evolved far off the main sequence and really puffed themselves up. I found this really neat high resolution simulation of a red giant. Honestly, the bubbliness wouldn't be that extreme, in my thinking. Or at least not enough to completely deform the star. Also, the luminosities of these stars can get humongous because of their large surface areas, so why AREN'T they brighter in SE? and the bubbliness can be quite extreme. Yes, and not only does this behavior appear in simulations of giant stars, but it also agrees very well with observations. Giant stars have giant convective cells. This was anticipated in the 1970s, before we could even do these sorts of simulations. It's a fairly simple consequence of their astrophysics. Also, the luminosities of these stars can get humongous because of their large surface areas, so why AREN'T they brighter in SE? Giant stars are indeed extremely luminous, because their greater surface area more than overcomes their decreased surface temperature. 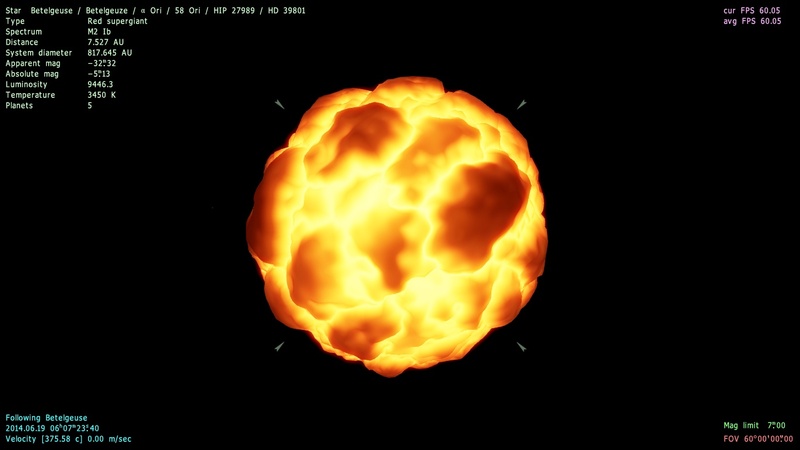 This is how SE models star luminosity by the way. So I'm curious what you think is wrong about it, or how you suggest it should be changed, or what math you have done to support your conclusion. Now, if you mean how bright a giant star looks from close enough to resolve it, then you may be confusing "luminosity" with "surface brightness", or how much light is emitted per unit area of the surface. This does not depend on the star's size, only its temperature. It's the T4 term in that formula above. Again SE simulates surface brightness of stars according to this, what we call a blackbody spectrum.